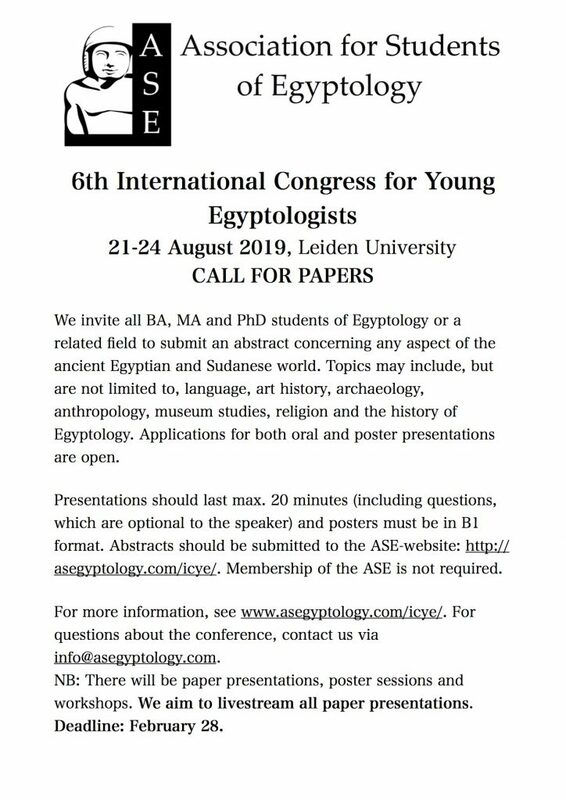 We invite all BA, MA and PhD students of Egyptology or a related field to submit an abstract concerning any aspect of the ancient Egyptian and Sudanese world. Topics may include, but are not limited to, language, art history, archaeology, anthropology, museum studies, religion and the history of Egyptology. Applications for both oral and poster presentations are open. Presentations should last max. 20 minutes (including questions, which are optional to the speaker) and posters must be in B1 format. Abstracts should be submitted to the ASE-website. Membership of the ASE is not required. To become a member, click here. For questions about the conference, contact us via info@asegyptology.com. NB: There will be paper presentations, poster sessions and workshops. We aim to livestream all paper presentations.